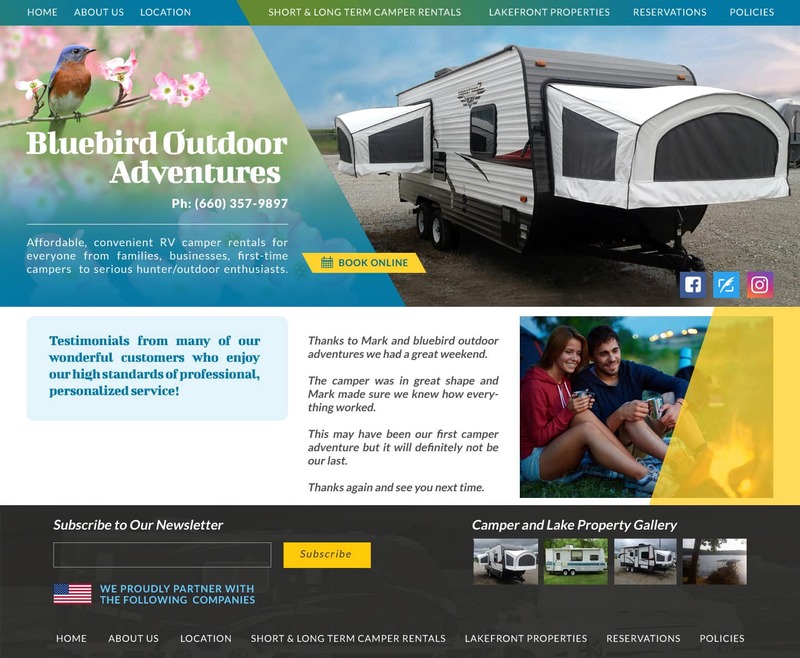 Website Design Cole Camp MI | This new website is mobile responsive and is easy to navigate. The website will interface with an ecommerce booking reservations system. Bluebird Outdoor Adventures specializes in a wide variety of recreational activities to provide a rich experience serving the entirety of Missouri. When searching Web site designer Missouri look no further than the web design professionals at VISIONEFX. Year after year our website clients come back to brand their business website. We design professional websites, custom database and ecommerce websites. VISIONEFX understands that great design elevates web sites above the rest and work to provide you the very best in web design. VISIONEFX provides services to national companies as well as small to medium businesses throughout the United States to include; custom web design, E-commerce web design, Word Press web design, Joomla web development, SEO and web maintenance services. Call: (757) 619-6456 or email info@visionefx.net.